Some large diamond producers have been trying to conquer manufacturing and retail, but will independent businesses pay the price? RAPAPORT... De Beers has been dabbling in the retail end of the diamond industry for more than 15 years, but recently, other miners have begun to follow suit, breaking out of the production box and entering other aspects of the trade. The move into retail was a natural step for De Beers, says David Johnson, the company’s head of strategic communications. Initially, De Beers undertook category marketing for the entire industry, which required the business to be active in other parts of the diamond pipeline. When circumstances changed, the company chose to invest that money in building its jewelry brand so as to continue promoting diamond demand. While the retail business is only a small part of the group’s overall finances, it is no less important. It provides not only revenue, “but also insight on trends and opportunities downstream, as well as other key strategic benefits, such as driving demand for the products we mine,” Johnson notes. Other miners are progressively seeing the benefits of diversifying. Alrosa has already segued into cutting and polishing its own colored diamonds, which it offers for sale directly to consumers, and is mulling over the possible purchase of diamond manufacturer Kristall. The Russian miner is also working on a number of projects aimed at the end consumer to make buying natural diamonds more appealing, says Dmitry Amelkin, head of strategic projects and analytics for Alrosa. Rio Tinto is likewise looking beyond a purely mining-driven business. Senco Jewels — an India-based chain of franchise stores — partners the Australia-based diamond producer with many of India’s top jewelers. The venture offers retail customers “access to Australian diamond jewelry collections by sourcing from the jewelry manufacturers who are authorized suppliers under Rio Tinto’s Australian Diamonds program in India,” according to Robyn Ellison, communications manager for Rio Tinto. All the diamonds in the jewelry products at the Senco stores will be sourced from the miner’s Argyle asset. These moves are not altogether unexpected for some of the large mining companies, says Kieron Hodgson, an analyst with London-based investment bank Panmure Gordon. But while the move toward a “side business” may prove beneficial to big mining companies, what effect will it have on the smaller companies that rely on the mid- and downstream part of the trade for their entire livelihood? Will miners — which can likely offer consumers cheaper goods with fully-disclosed provenance by cutting out middlemen — push existing manufacturers and retailers into a smaller corner of the market? Wetherall backs up this sentiment. While Lucapa is not currently interested in moving into retail, that may change down the line, he suggests. If the right opportunity arises, the company would be open to working together with retailers. For their part, manufacturers and retailers don’t seem overly worried about the potential encroachment on their territory. “[While it’s possible] it may hurt some small businesses, it will facilitate growth in others,” says Stanley Zale, vice president of diamond and gemstone procurement for US-based manufacturer Stuller. He points out that the longtime presence of De Beers in the space hasn’t taken away from existing businesses. Harris Botnick, the owner of Worthmore Jewelers in Georgia, sees the potential drawbacks, but doesn’t believe the miners’ expansion will ultimately change industry dynamics. “No doubt, more competition muddles up the market,” he says, and independent jewelers must “continually work to reinvent themselves and grow so we can be the ones to deliver the final piece of jewelry to the end user.” However, he points out that the day-to-day details of running a downstream businesses — such as selling one item at a time and dealing with warranty issues — may be difficult for miners to adjust to. And while some consumers might be swayed by the cheaper prices and easy traceability the mining companies can offer in the retail space, Botnick believes others will still rely on independent jewelers when it comes to purchasing quality pieces. Branching out: Miners’ forays into other parts of the pipeline De Beers: The miner founded its first retail venture, De Beers Diamond Jewellers, in 2001 and opened its first location on London’s Bond Street in 2002. The project was originally a 50/50 partnership with LVMH, but De Beers acquired the French luxury-goods company’s shares in 2017 and now fully owns the brand. Nearly 20 years later, the retail outlet, now known as De Beers Jewellers, has 34 stores, six of which are in North America. In 2008, the miner also launched the Forevermark brand. Rio Tinto: Bandhan Jewels, a joint jewelry project with popular Indian retailers, launched in June and features Australian diamonds from the miner’s Argyle asset. Retail partners include Being Human Jewellery, Farah Khan Fine Jewellery, and Kisna Diamond Jewellery. Alrosa: The Russian miner made the move into cutting and polishing in 1994, but founded its Diamonds Alrosa manufacturing enterprise in 2000, with branches in Moscow and Barnaul. 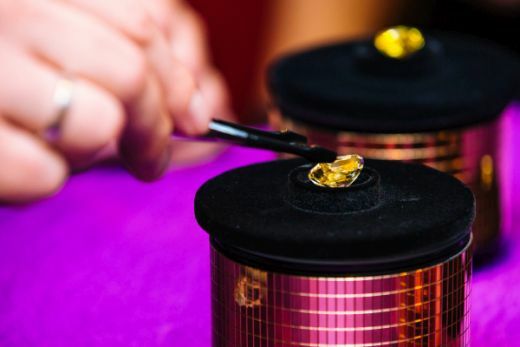 Last year, Alrosa made the transition into manufacturing specialty stones, including colored diamonds, which it sells to the consumer via auction. Lucapa Diamond Company: In its last investor presentation in August, Lucapa outlined its projected growth strategy from a purely mine-driven business into the mid- and downstream sectors. The company will begin manufacturing its own stones in early 2019, a process it will roll out in a measured manner throughout the year, it said. Although the miner is not currently looking to enter the retail space, it has raised the possibility of doing so in the future, likely through partnerships with existing retailers. This article was first published in the January 2019 issue of Rapaport Magazine.